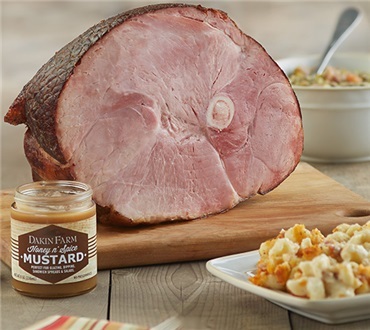 There is nothing like a good, old-fashioned ham dinner complete with hearty mac-n-cheese as well as split pea and lentil soup mix to be used with the leftover ham - just like grandma makes! Dakin Farm gives you the ability to ship items in your shopping cart to different addresses — yourself or someone else. Sending Gifts - If you're sending an item to someone else, simply select "Someone else" from the "Ship To" drop down menu before you add the item to your cart. If you are a registered shopper who has already signed in, any entries in your Shipping Address Book will also appear in the list of Ship To options. Sending the Same Gift to Different People - If you're sending the same item to multiple people, choose the quantity you wish to send to each person and make your "Ship To" selection (see above) and then add the item to your cart. Repeat for each person with a different shipping address. Changing the Ship To option - After you add an item to your cart, you can still change your Ship To options on the Shopping Cart page. Shipping to Yourself? - After entering the quantity, simply leave the "Ship To" selection on "Myself" option and then click the Add To Cart button. You just can't find good hams in the supermarket, but this was delicious, smoky, tender not overly salted and I can't wait to make some lentil soup with the bone! Copyright © 2019 Dakin Farm, Inc.